For flowers in this genus this is THE plant. 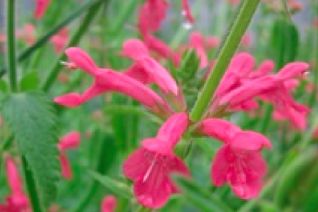 Upright growing plant from a clump that rises to 2′ and produces multiple spikes of bright coral colored flowers. They are arranged in symmetrical whorls up the stem. Loved by hummingbirds who constantly seek nectar from the flowers that appear from late spring to late summer. When flower spikes are spent simply cut them away and water and more will arrive. Very easy to grow long blooming perennial for full sun to part shade in rich, well drained soil with light but consistent summer water. Very drought adapted when established. Works well in borders and even seasonal containers. The leaves have a very familiar lemon lime aroma. Dies to a low clump of foliage in winter.